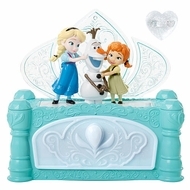 Experience the magic of sisterhood as young Anna & Elsa come to life and build the loveable snowman Olaf with the Frozen Jewelry Box featuring "Do You Want to Build a Snowman?" from Disney's Frozen. Heart ring included! You can also store your favorite Frozen jewelry inside of the jewelry box.